Inclusive, articulate and very 2019, the show’s progressive-mindset designer Christian Siriano replaces Tim Gunn. ELLE editor-in-chief Nina Garcia is the only returning judge, with designer Brandon Maxwell and former “Teen Vogue” EIC Elaine Welteroth rounding out the fab five. 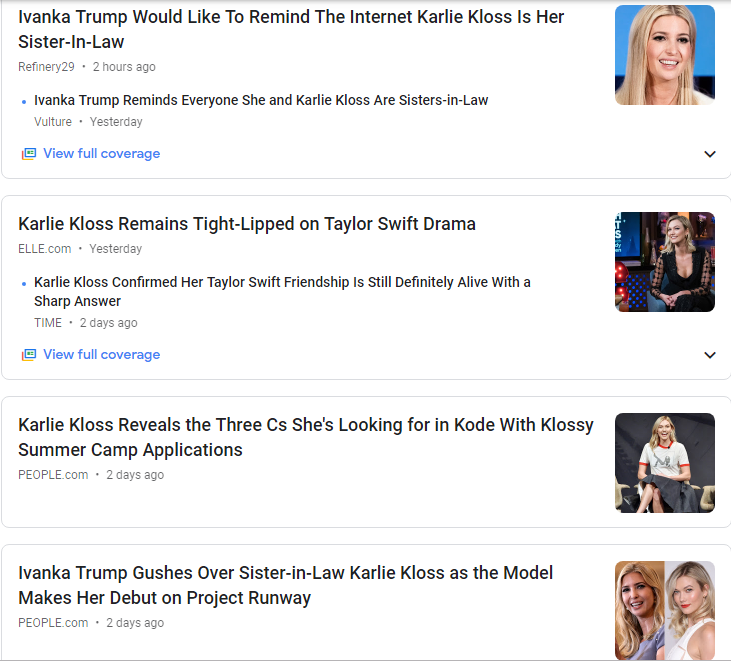 Alas, the media and its readers have one obsession according to Google: It’s not clear who is driving the Karlie news car, and I fear it’s media insuring Ivanka Trump’s gushing dominance of Karlie’s headlines. Yes, they are snarky, because we all feel that Ivanka never misses an opportunity to ride Karlie’s progressive coattails in the news — as if Karlie’s well-earned hato-effect will somehow ruboff. But we could choose — indeference to Karlie Kloss — to let Ivanka’s gushing Twitter commentary go silently into the night. Unlike Ivanka Trump, Karlie Kloss is INDEED self-made. No Russian mafia Don sold condos for cash to finance her solidly Midwestern upbring. Kloss has married the man she loves — Joshua Kushner — with a complicated family situation, as they say. When a public-adulation sister-act only goes one way, it’s because the other party typically prefers to control her or his own narrative. The always-astute Kloss knows that America thrives on any news, especially nuggets of dissonance between Karlie and Ivanka. Then we have dissonance between Karlie and Taylor Swift. The always chirpy, super-smart, business-savvy, socially-conscious Kloss always takes the high road, but surely she hides an inner primal scream when others co-opt her achievements. In a week where Karlie has to be thrilled about the debut of Project Runway on Bravo, in the top 25 cable shows among adults 18-49, according to Nielsen, America wants to talk Ivanka. You can compare the ratings against Project Runway on Lifetime from October 2017. There’s always confusion about a show moving from one network to another, and here’s where Karlie’s social media presence comes into play. We’ll check back in a few. The other headline that got our attention is Karlie taking to the streets of Manhattan to share the news that applications are open for her Kode With Klossy tech summer bootcamp. Out of deference to Karlie, we’ll keep our lips zipped, except to ask: “Seriously, can you see the other blonde in this convo running around Soho with her mobile signup stand in tow, getting the word out on her determination to teach girls to code. If you say “yes’, we say “You’re fired!” Read on at People.